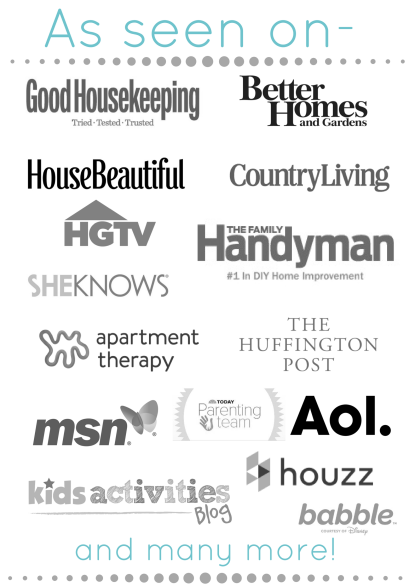 Function, function, wheres your function in your home? Sing that in the best old school School house rock “conjunction, conjunction whats your function” voice. I like to add function to my home, and sing along to songs, loudly. In case you were wondering about me. Our home is a good size, 2,000 square feet is not too big or too small. Once you add in three kids and two adults worth of stuff things start feeling cramped. Which is why I am always on the lookout to add function everywhere. 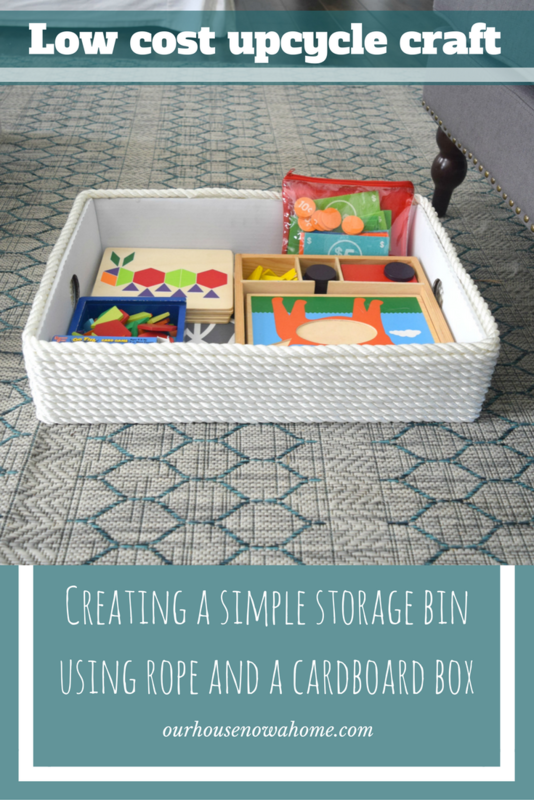 Creating a simple storage bin using rope and a cardboard box is just one of the many solutions I have used to organize my home. 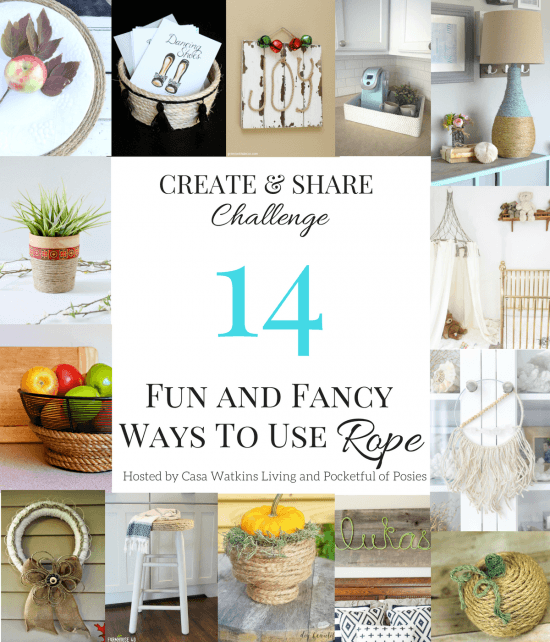 This project is part of a monthly Create and share challenge, for the month of September the theme is rope. This project came together in a round-about way, I had this flat box which I decided to keep instead of recycling it. 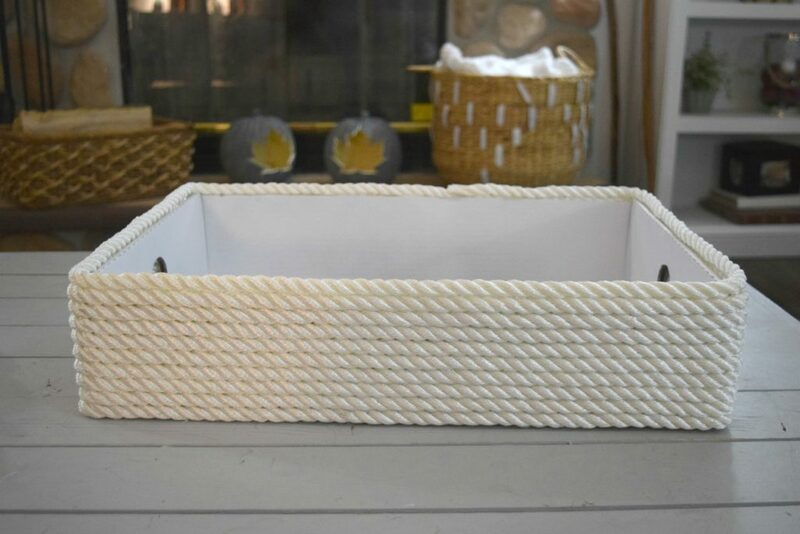 I liked the size of it and knew it would work for a great storage container or even tray for decor. Then when I realized I had to make something using rope for this challenge it all came together! Yes, I am the type of person that will make something for plans to use it in the future, eventually. 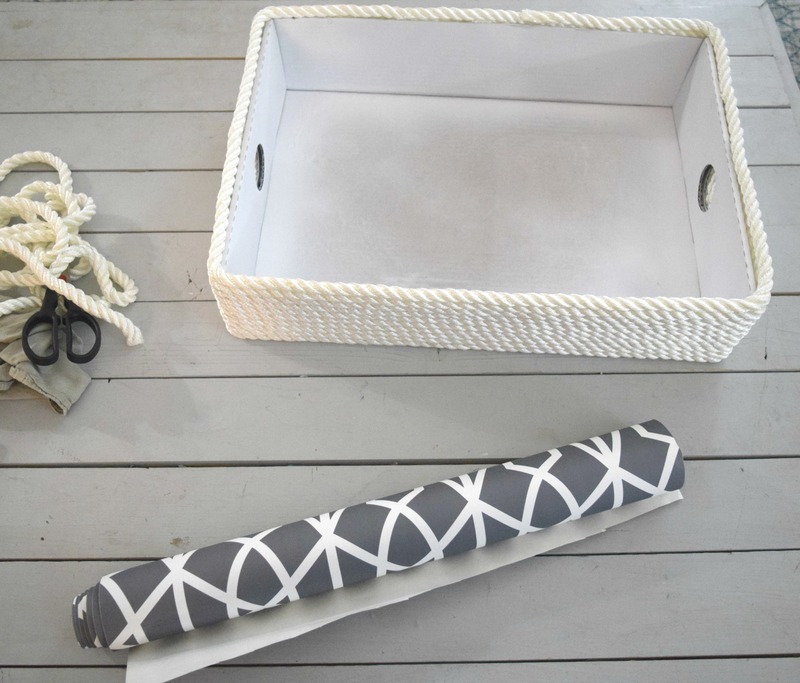 I always need baskets, bins and storage ideas… always. So if I see one I like in a store, or have an item I can upcycle into one I do it. Even without a set plan of use, because I am crazy and out of control like that! Watch out, pretty soon I might be cutting the tag off of mattress! Dun, dun, dun!!! You cannot get more low cost than using a cardboard box to create storage! This was left over from a trip to Costco, we will ignore the large amount I spent on Costco, which as a family of 5 I am sure you can guess is a pretty penny each time we go. But, I did not go there for the purpose of the box, it was a happy result of the trip. Also, feeding our family. Anyways, back to the DIY simple storage! I spray painted it white. 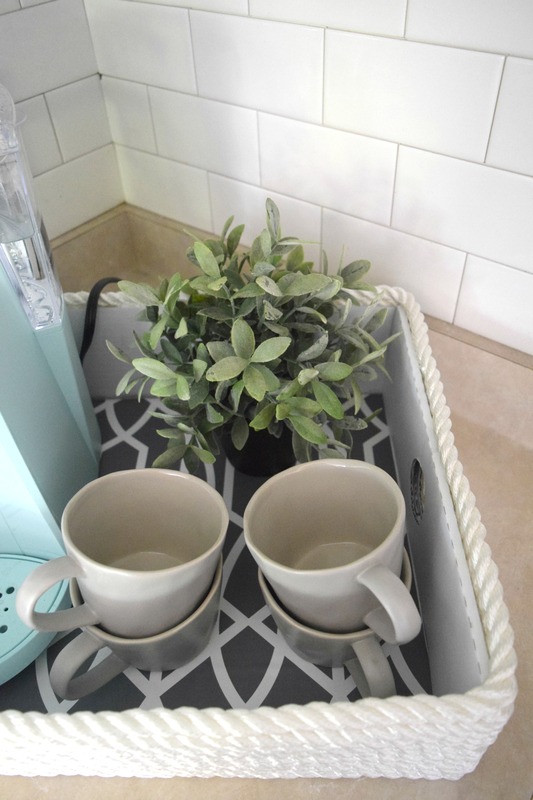 My initial plan was to put wood planks on the surface of the tray, the interior portion. As I was working on it I came up with a different idea. One with more texture and patterns! Time for the rope portion of this craft! It is really simple. On a side note, when you are doing this take note of the box. I loved the size of this one, flat, low but big. However, the circles on the sides are a little weird. 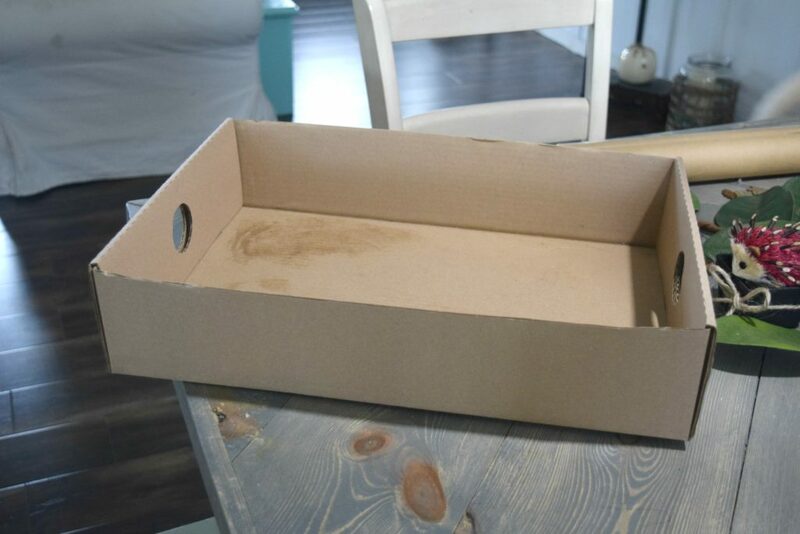 I made it work, but if you can get a box without any cut out portions. 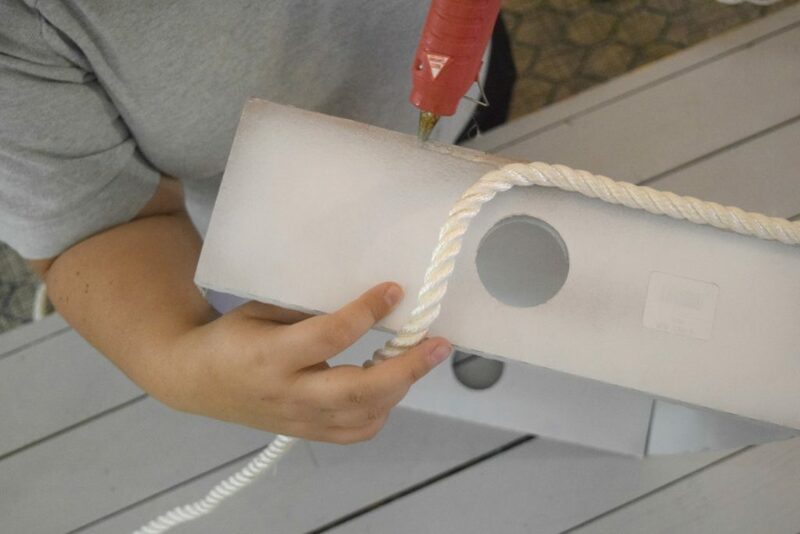 Using hot glue gun and putting a line of glue down on the box. Then pressing the rope down. I did this to surround the complete outside of the box. I have seen so many bins, containers and baskets wrapped in rope. It is really trendy right now, but those items can be crazy expensive in stores. This coast me maybe $10, for the massive rope and the paper I am putting on the interior. I love the white rope, it feels coastal to me without being over the top. 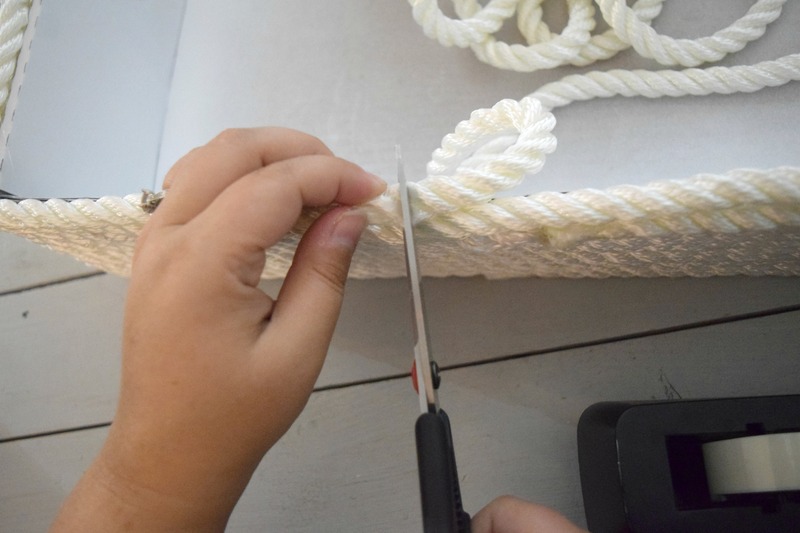 Add standard clear scotch tape to the portion of the rope you want to be the end. Then cut with scissors. Once done the rope is cut without it becoming frayed and possibly undone. The storage bin is roped-up! 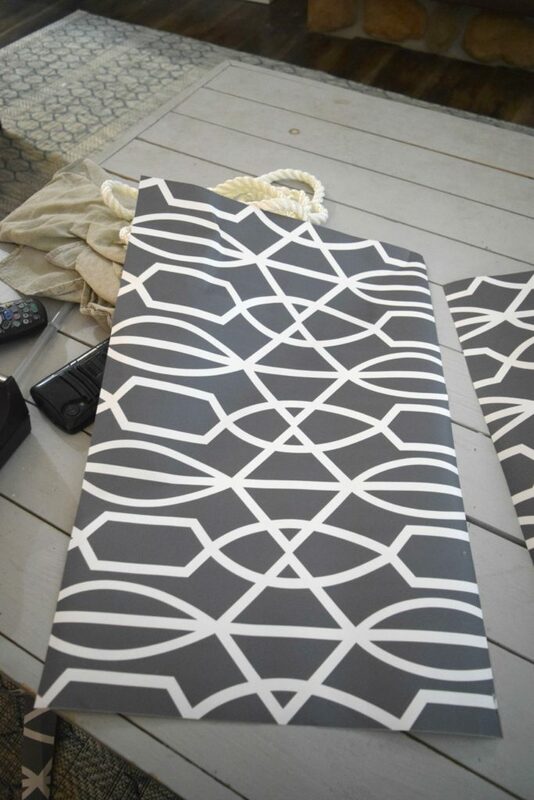 I had this peel and stick paper from a previous bench redo I did. I love the paper and it is so easy to work with. I measured the box and cut the paper down to the correct size. When doing something like this I always cut a little more, to have some excess in case I need to alter it. It is always easier to make a few more cuts over trying to either add more paper or starting over. Peel the paper and stick down! Seriously, peel and stick paper is the easiest thing ever! I will be sharing another project this Friday with a different peel and stick paper, be sure to check back in for that one! This is done! 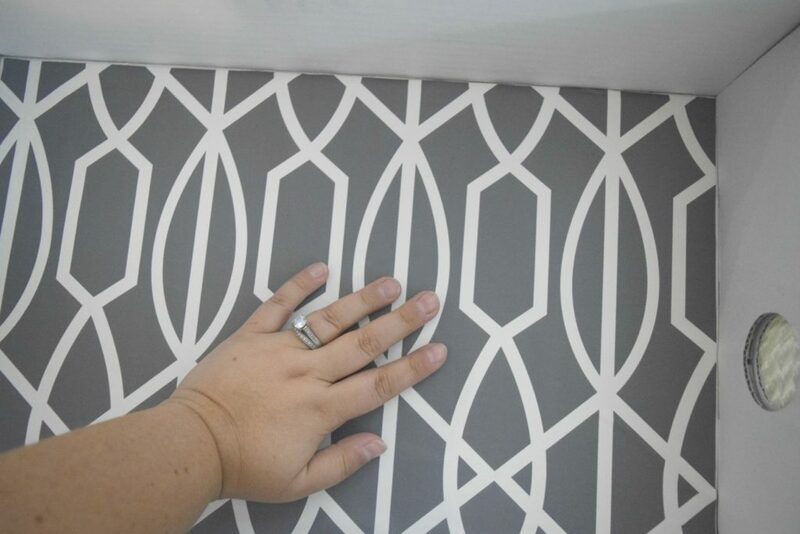 I love the pop of dark gray with the fun pattern. Then the stark and clean white of the rope is the perfect combination. This is where I had a little fun, also some regret. I had a few different ideas on ways to use this bin. My regret is that I did not make a few more. See, I told you there is always a use for storage bins and baskets. I first set it in my kitchen, to corral my coffee maker and mugs. We have limited counter space, so having everything contained like this is really nice. Also, if need be and we are doing a big time cooking job I can simply pick up the whole box and remove it from the counter, with all of it’s items inside. I am officially in love with wrapping things in rope! 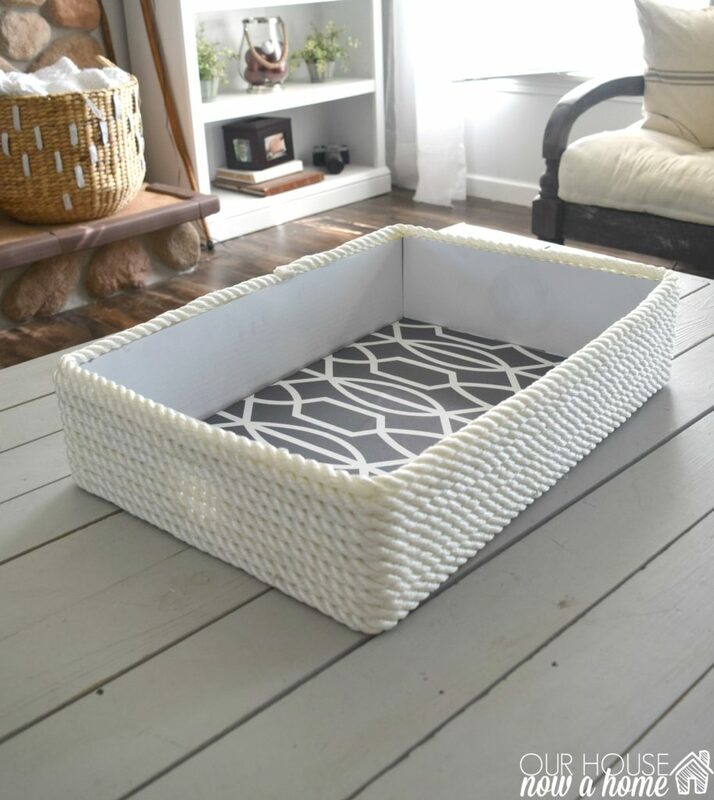 I have so many baskets, bins, boxes and even furniture that this would look great with! 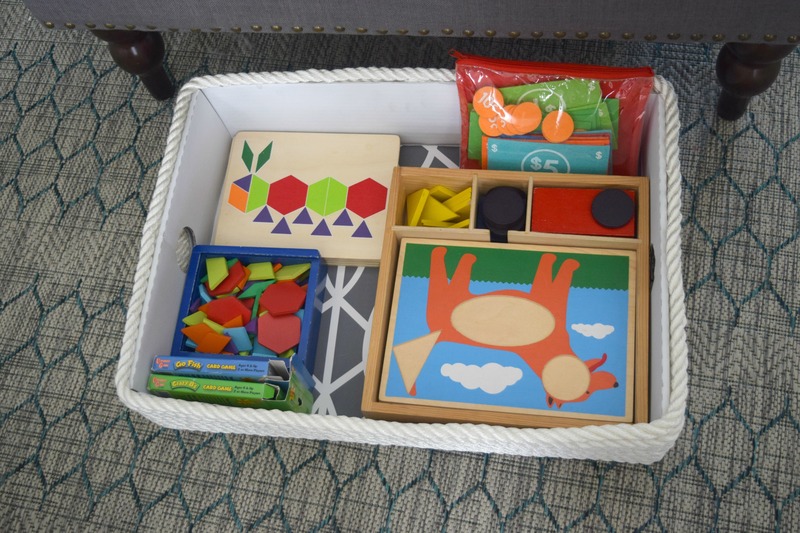 The other option for this simple storage bin using rope and a cardboard box is to use for some toy storage. My kids are past the “baby” toy phase. They also for the most part have all of their toys in their bedroom. We do have a few puzzles and card games that we keep in the living room for family fun or for a child to play with quietly in the living room. But, I do not want our living room to resemble a play room. Been there, done that, found toys in the refrigerator and the little drawer under the oven. My days of tiny kids and their toys everywhere in the home are over. So having a few select toys in the living room, but out of sight is the way to go. As you can see, this works perfectly to sit under a chair, sofa, or even in one of my bookshelves on either side of the fireplace. I may make another one of these and then put one on each bookshelf. 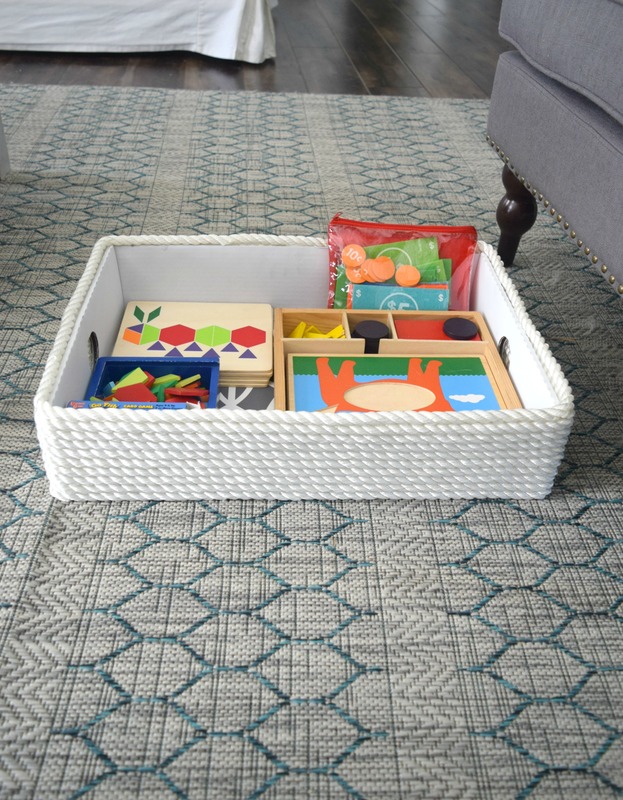 If I had purchased a small storage bin similar to this from a store, I would have spent more money and not gotten to play around with the colors and texture of the bin. DIY lets me customize it! 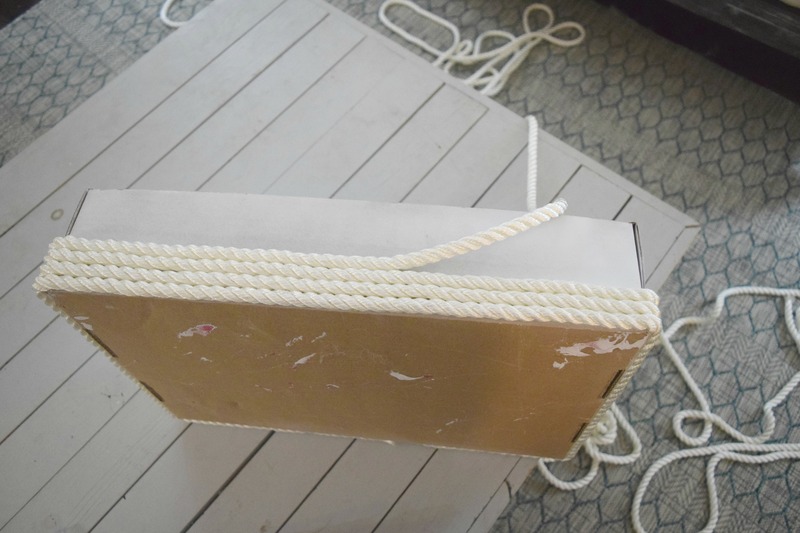 Creating a simple storage bin using rope and a cardboard box is pretty much my happy place. I used random items, rope, a cardboard box, peel and stick paper and spray paint. 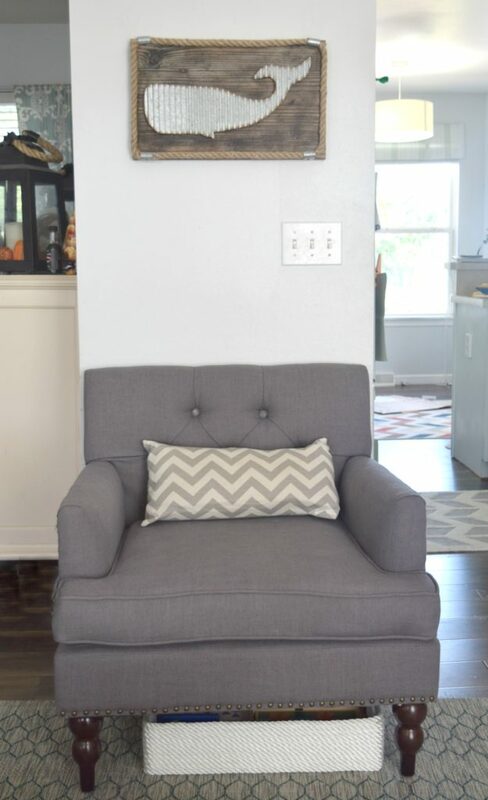 It all came together in the best way to add a little bit of storage and a little bit of style to my home! 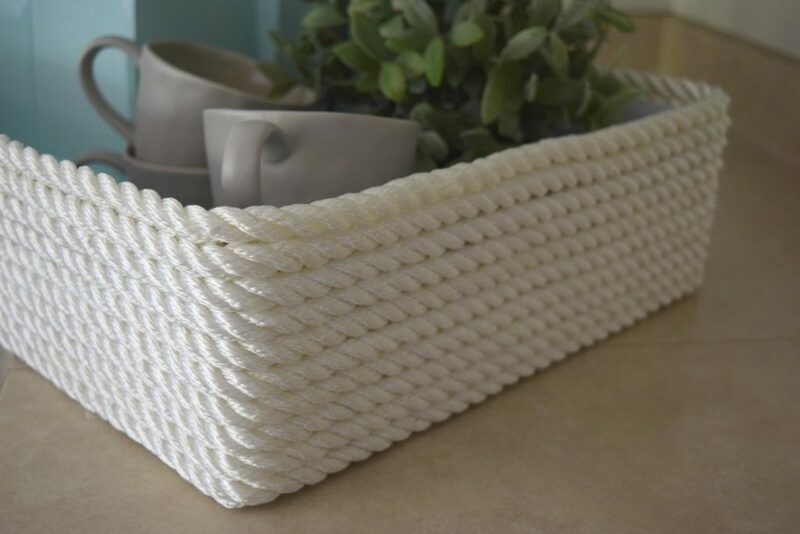 This would also work great as a table top basket to put books, a vase or other smaller decor items. I love to group together little trinkets and set them in a flat basket, a creative way to decorate a table surface. 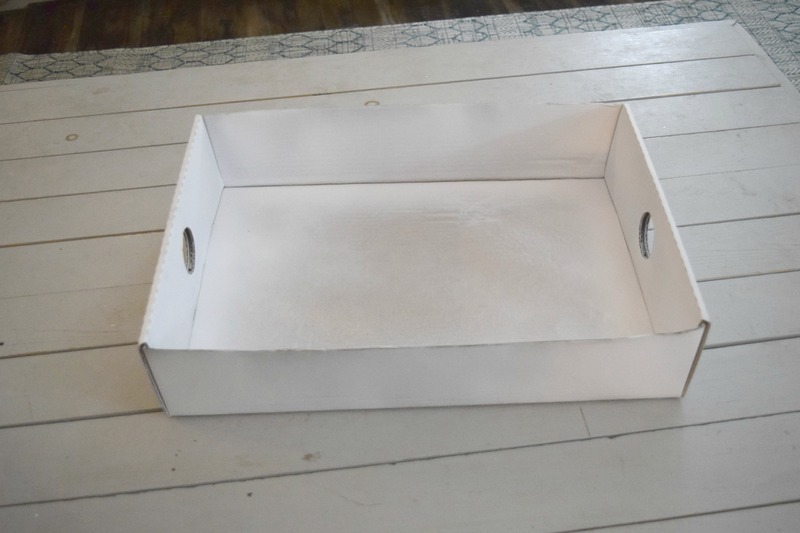 What I am trying to say is, if you have a cardboard box like this create a storage bin or decorative basket with it! Or at the very least recycle it. 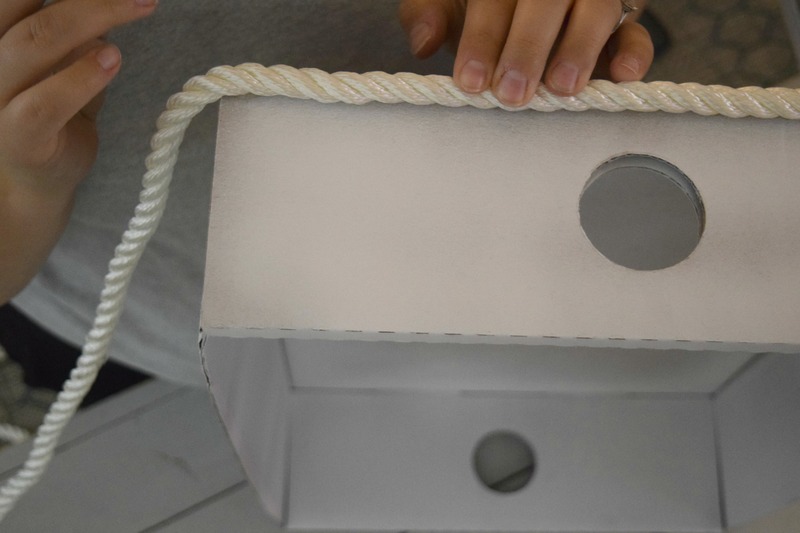 This simple storage bin using rope and a cardboard box is part of the Create and share rope challenge. You can go to all of the other participants and see what they created with rope! I love decorating, crafting, DIYing, messing around with power tools, and getting to house stalk. 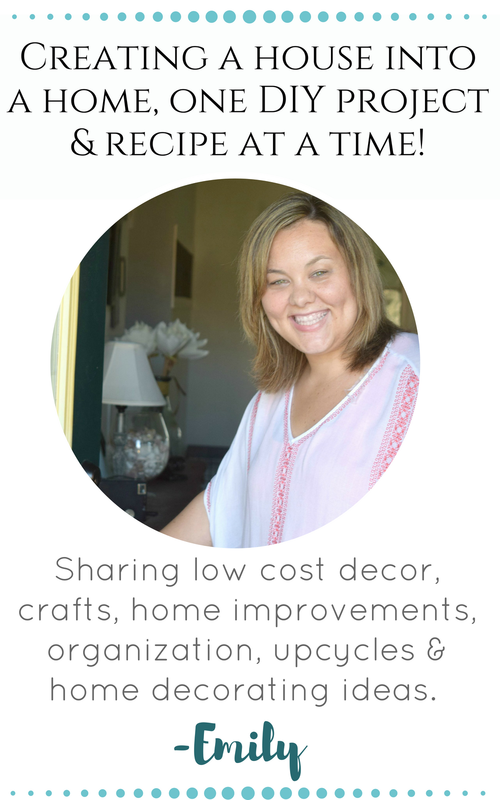 Today I can throw in some inspiration from the other talented bloggers. Yes please to everything! Emily, I’m jumping up and down! This is so cute and easy to make. I love all the possibilities. Pinned!! Ha ha, I am so happy you liked this idea Amy! Emily……what a wonderful creative idea. 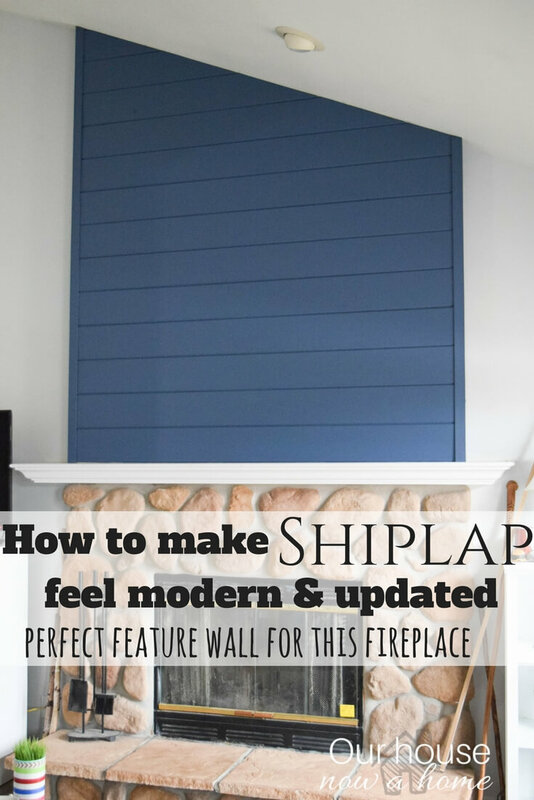 I am always looking for ways to create more storage. Thanks for the idea. Love it. Thank you! 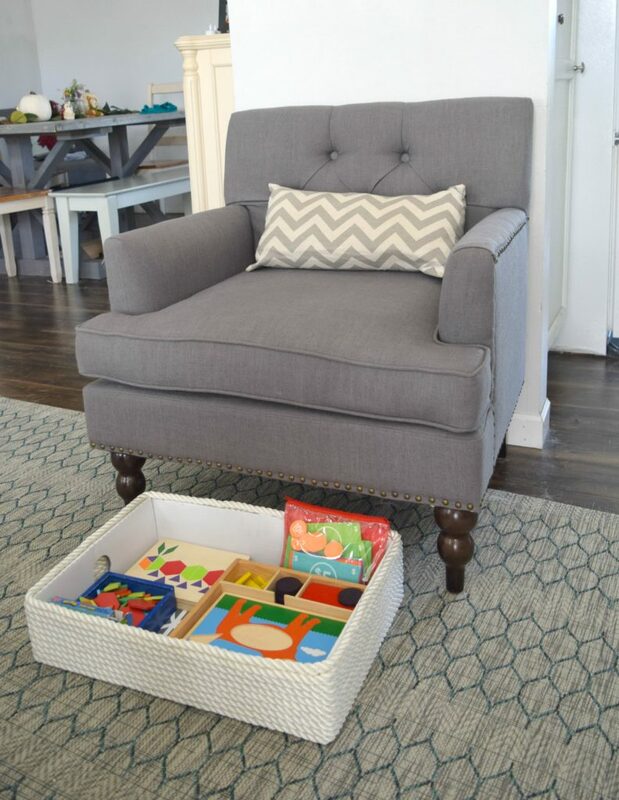 Having little storage options like this are always welcome in a home! 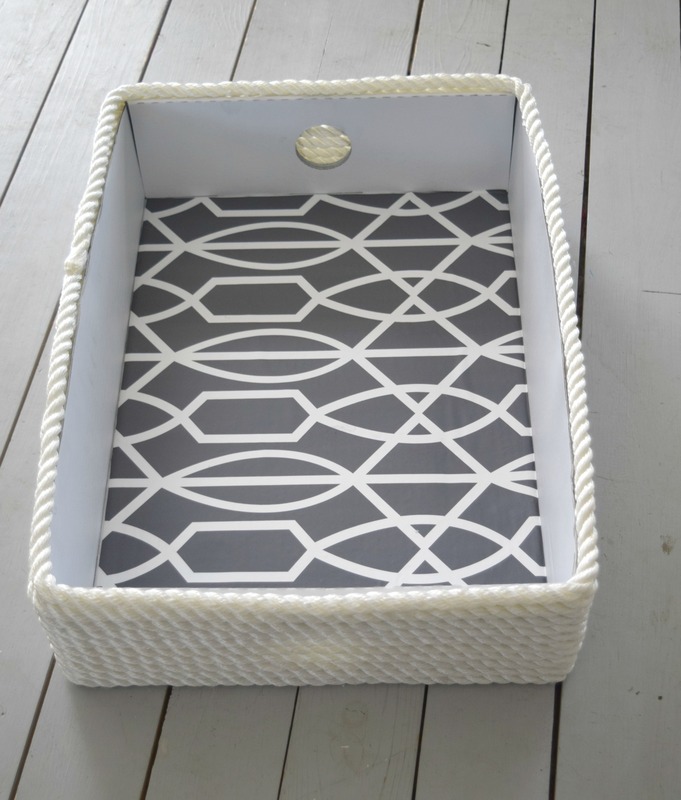 I love it Emily, baskets and cute bins are so pricey…but necessary! I’ll be making some of these! It is surprising how expensive they can be! This is a great low (or even no) cost option! Thank you! I really like that it is made to be useful in another way. 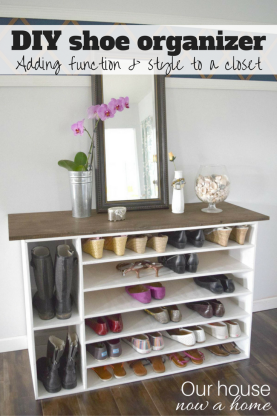 This is such a fun idea – what a good upcycle! 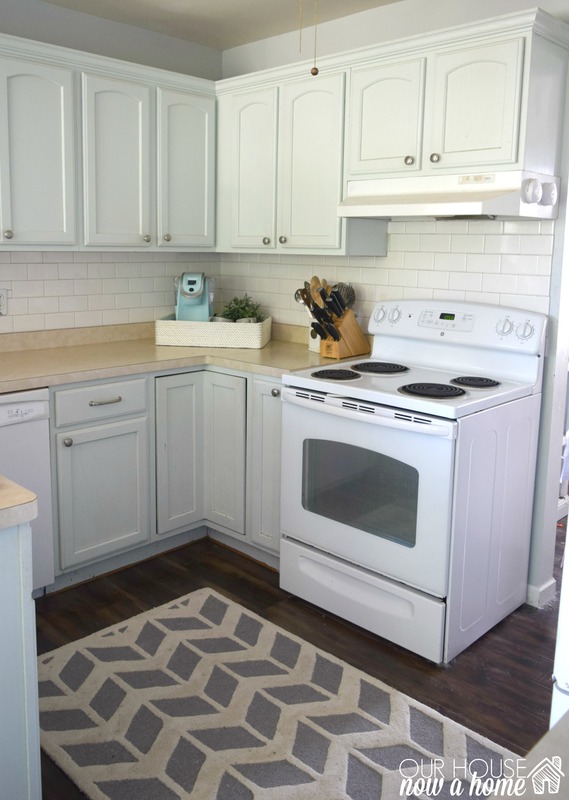 I love the white rope, too – such a clean look! The white rope you chose with the white box and pretty liner is so beautiful! What a great project. Pinning! 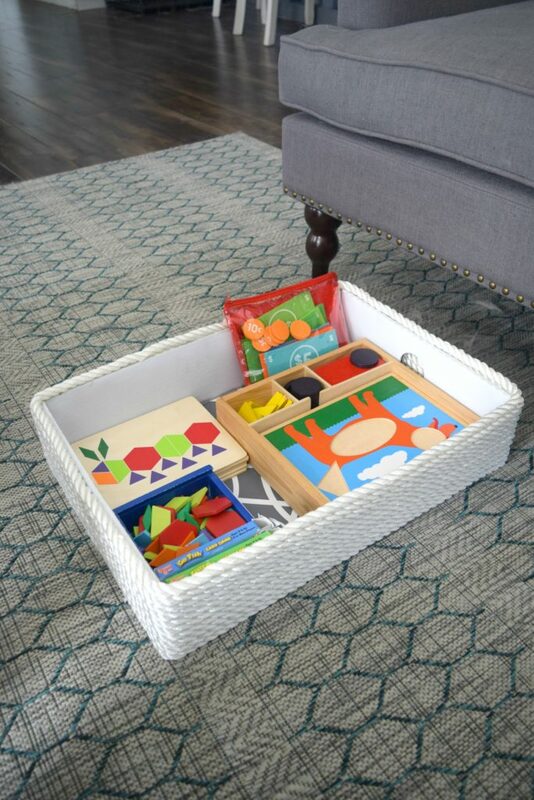 I definitely wouldn’t mind a cute basket like this in our family room! It would be so helpful in gathering all the toys up every night. Beautiful job! That is a great use for this Stephanie! 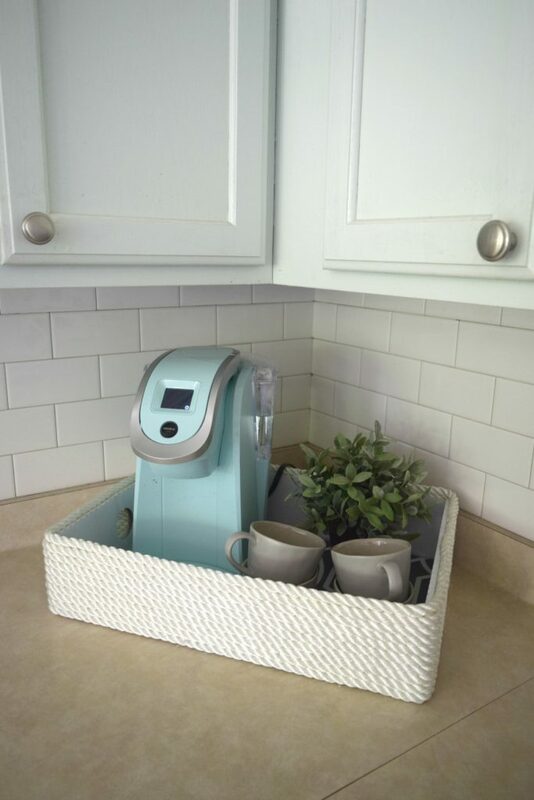 I like this for the coffee station! I have so many boxes lying around that would be perfect to update like this. I also love the pattern paper as the liner. We tend to have a lot of boxes as well, this is a great upcycle of them! Ok, now I’m just upset that I didn’t do this myself! I could use DOZENS of these baskets! (Also, I am in love with your chair.) Pinning! So true about needing dozens of these! 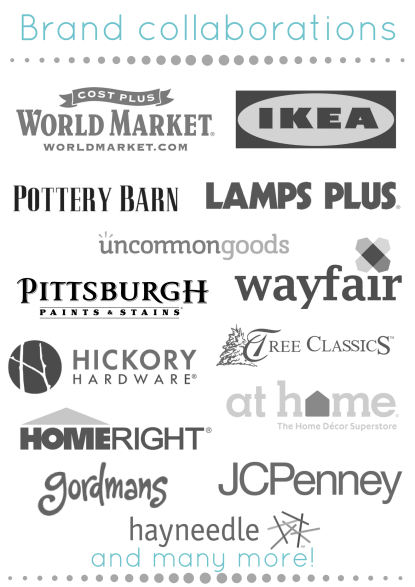 They are so versatile and easy to use! 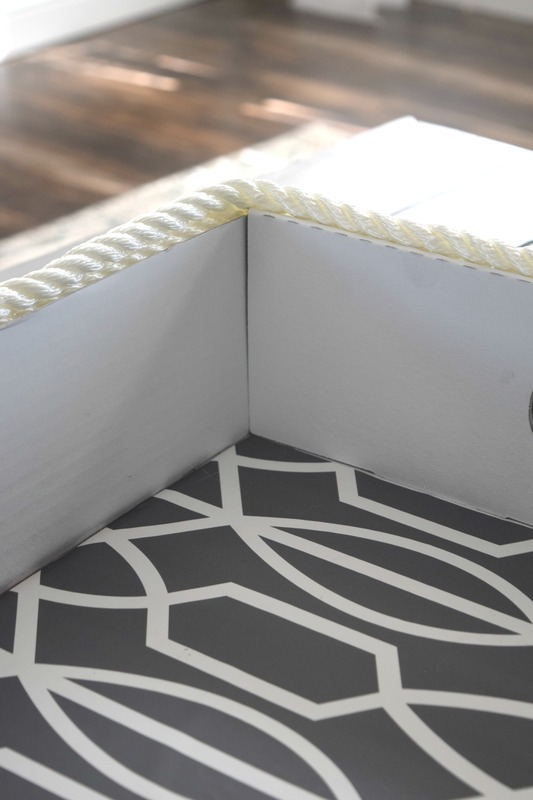 Cute box upcycle Emily! 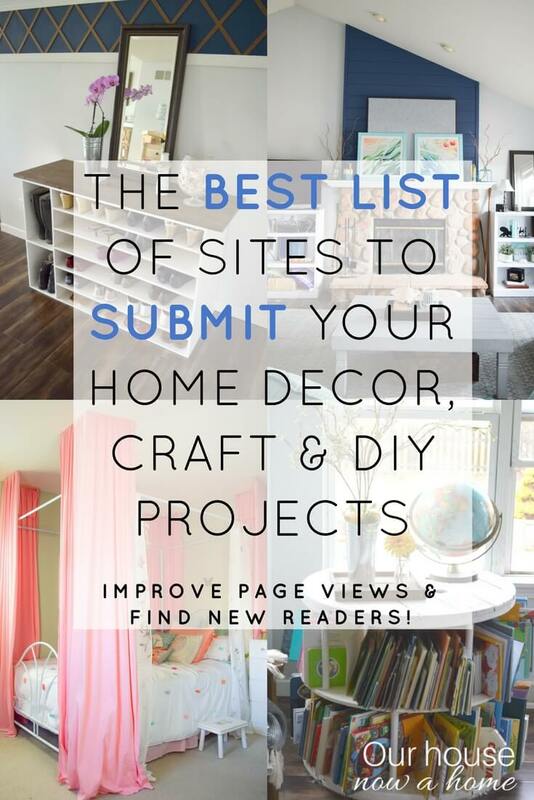 I love to reuses discarded items and this is a fantastic way to do it! Thank you! Pinning! 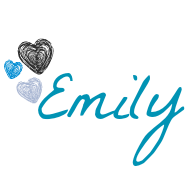 Lovely, Emily! I love that paper, so cute and it goes perfectly with the rope! Pinning. 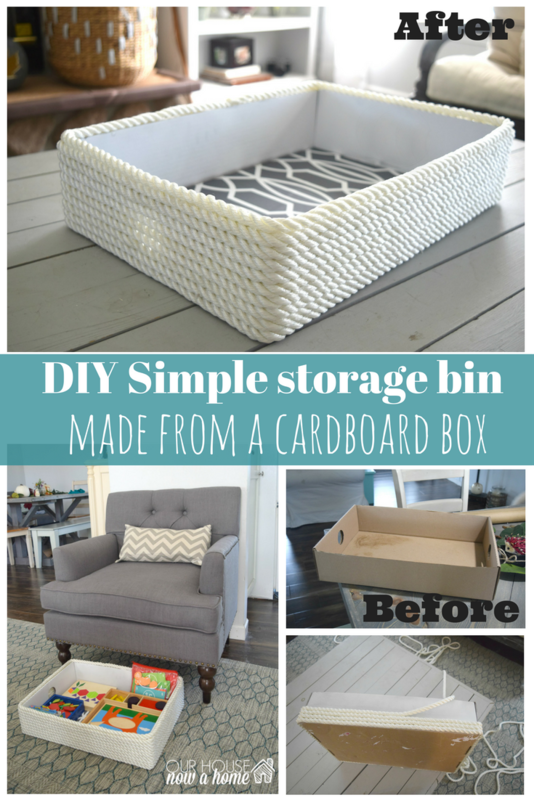 It’s so cool that you can take something that would otherwise be thrown away and create such a pretty storage container! Love this! You could never have too many storage boxes. Pinned! Super cute and useful!!! Great job! 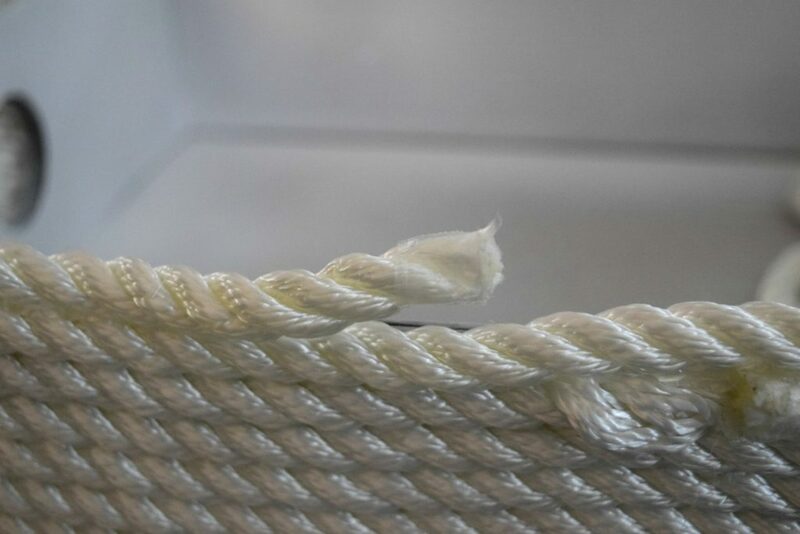 Hi I new to this but would love to know the width of the rope and where you got it?? This is so creative! I would have never guessed there was cardboard underneath! Very cool! I’m trying to do this project but struggling. 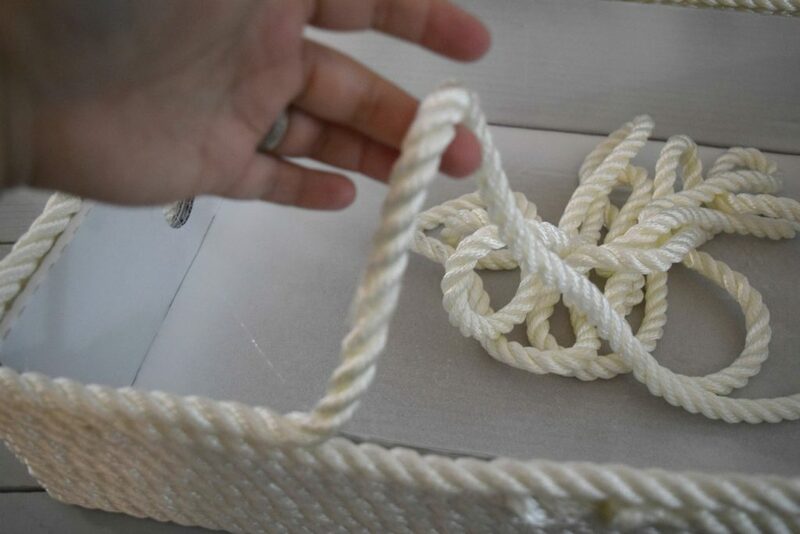 Do you wrap the box without ever cutting the rope or do you cut a new piece of rope for every row? This is a perfect idea! This box could even be stored in the living room! Going to try it myself! Thanks.